Over the long weekend in Mali (Easter Monday was a day off for schools and offices here), the country’s process of transition from military to civilian constitutional power was officially launched. President Amadou Toumani Touré appeared on state television on Sunday night, for the first time since before the coup, to announce his resignation. National Assembly speaker Dioncounda Traoré has been meeting with various members of the classe politique in Bamako as well as with the CNRDRE junta, and Mali’s supreme court has convened to pave the way for Traoré’s official designation as the country’s new head of state. This process has been hailed internationally, including by the United Nations, and members of the global media have confidently reported that the coup leaders are stepping down. There’s just one problem: Not only are the junta’s members still occupying Mali’s political stage, but they may have no intention of leaving it anytime soon. 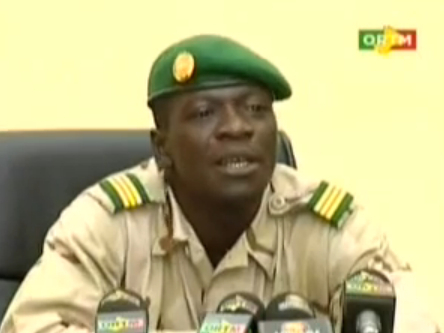 Appearing on state TV on Monday night, CNRDRE head Captain Amadou Sanogo indicated that he means to play a role in Mali’s political transition, a role which may be at odds with the role he was expected to take under the auspices of an agreement reached between the junta and the regional body ECOWAS late last week. While members of the international community are congratulating themselves for pulling Mali back from the brink and getting the Malian military to hand over power, these remarks suggest that Sanogo thinks he and his fellow coup plotters have given up nothing. The CNRDRE is not being dissolved, and its members mean to play an abiding role in Mali’s political affairs, including naming the prime minister charged with organizing elections and reunifying the country. The interim president, Dioncounda Traoré, will only be in office for 40 days, after which Sanogo and his men will again (or perhaps still?) be overseeing the transition. The military takeover, in other words, is something that cannot be nullified or cast aside by the actions of mere men. And Sanogo feels it is his divine right to occupy the position he now commands. Is Captain Sanogo using the same tactics as Cote d’Ivoire’s ex-president Laurent Gbagbo, manipulating those seeking to marginalize him, appearing to accede to their demands while actually digging himself in more deeply and clinging more resolutely to power? Part of the problem is that the preliminary accord signed on 6 April could not be more vague on what if any part Sanogo and his men can play moving forward: it merely reads that “the role and place of the CNRDRE members in the transition process will be defined” (chapter 2, article 6, letter e). At a juncture characterized by ambiguity and grey zones, two things are clear. One, the agreement signed between the junta and ECOWAS last week is being interpreted by different actors in very different ways. Two, ECOWAS, foreign governments and the international media need to keep a close eye on the junta leaders to ensure that Mali’s return to constitutional rule does not skid off the tracks. In his own mind, at least, Captain Sanogo appears to be a long way from stepping down. This entry was posted in Uncategorized and tagged amadou sanogo, bamako, cnrdre, coup, mali, politics. Bookmark the permalink. thanks for the insightful commentaries, bruce. hope you guys are all doing well. thats so bad, are you still in mali? I cant believe that i came back two week before de putsch. Thanks for all your words! Thanks Youssouf for linking to this blog from that discussion! I think the dialog has been constructive. In the Malian context, I believe Sanogo’s references to God should be interpreted rather as a sign of humility, and should not mean he believes he has divine powers. Nobody said anything about divine powers, but divine right. I’m wondering what is being discussed in Mali or by ECOWAS about emergency aid for hungry people in Mali and surrounding countries, due to a shortage of food locally and to refugees fleeing due to the unrest. Is there talk of this in the transition, or are things so incoherent that bigger humanitarian issues are not discussed? I only see an ECOWAS statement from mid March. If the regional response is lacking, do you know of reputable aid groups that remain active in Mali and surrounds that can actually help in getting food and medical help to people? I’ve read so much about how aid is responsible for so many ills, but is emergency aid different? This is a pretty big topic, and perhaps not for this particular post! Thanks.